Beyerdynamic began in Berlin in 1924 to build cinema speakers, laying the foundations for a world leading manufacturer of headphones, microphones and conference systems. Across the entire portfolio, Beyerdynamic products are characterised by the company’s desire to innovate and continuously develop technology. The “Made in Germany” quality promise applies to product development and manufacture: the designs of Beyerdynamic engineers and designers in Heilbronn are then built by approximately 180 highly qualified employees in Germany – mostly by hand. Each of their products contains true passion and know-how for an excellent sound experience. Today the name Beyerdynamic is synonymous with a wide range of high quality and professional audio products, as there are microphones and headphones for professional studio or stage application, as well as for high-end music listening at home or compact in-ear models for hi-fi sound on the move. Further, Beyerdynamic conference technology can be found in conference centres all over the world. 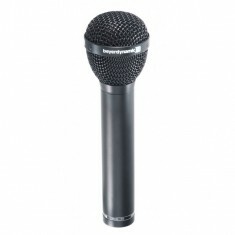 Mic Hire stocks the Beyerdynamic M88 TG microphone, ideally suited for use on instruments and vocals and particularly excellent on kick drums, bass amps and brass.